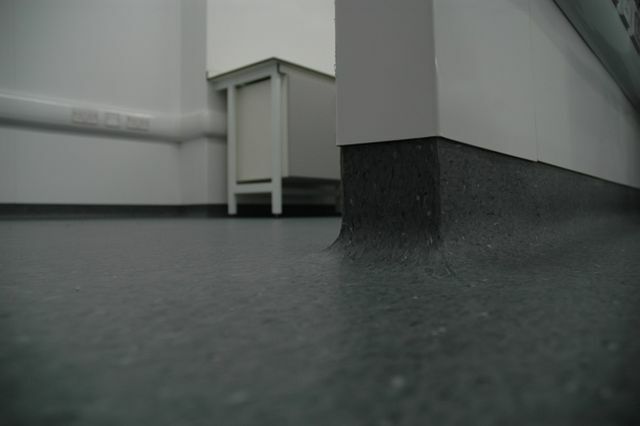 Pressure from footfall creates a slip resistant surface. High polyvinyl chloride (PVC) content, making it easy to weld. Cellulose backing allows it to bond with water-based adhesives and provides a water-resistant, hygienic finish. Contains antimicrobial BioCote® silver ion technology that reduces microbes by 99.9% in two hours - with an 80% reduction in the first 15 minutes. Suited for use in commercial kitchens. The additives used in BioCote® are registered with the Environmental Protection Agency (EPA), Food and Drug Administration (FDA), Biocidal Products Registration (BPR) and is certified by HACCP International. Antimicrobial (to ISO 22196:2011): Log10 ≥ 4.83 - 99.9%. Classification (to EN 649 and EN 685): Commercial 34; Industrial 43. Indentation (to EN 422): ≤ 0.10 mm. Slip resistance (Appendix A - wet pendulum; Appendix D - oil, wet): P4/ 5. Flexibility (to EN 435): 20 mm mantrel (pass). Colour fastness (to EN 20105-B02): Method 3 >6.